Fall has begun and I'm craving some hearty and healthy food. I love this idea for a salad using seasonal fall ingredients. 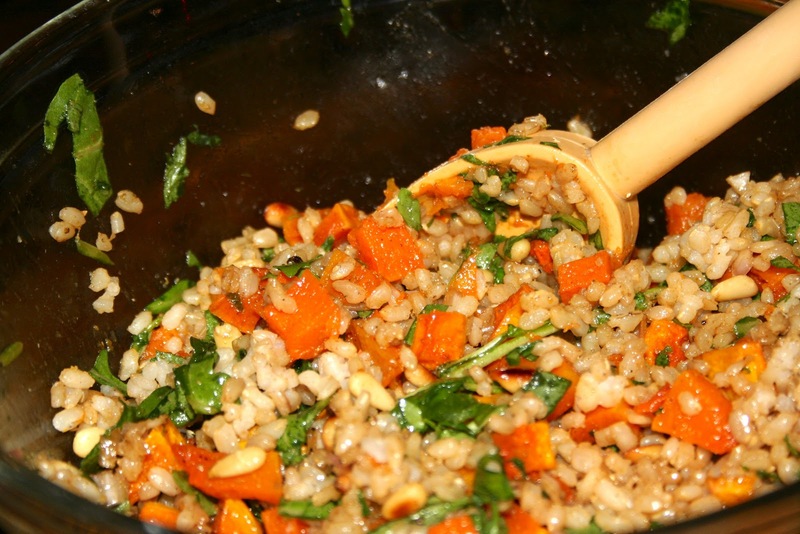 Roasted butternut squash and brown rice pair up nicely in this vegan salad. Arugula can be seasonal in both spring and fall as it grows quickly in the cool months of the year. I like to use baby arugula as it is a bit more tender and less pungent than the full grown arugula. This dish while being totally tasty and Foodgasm worthy, is also very healthy and chock full of vitamins and minerals. The brown rice adds a gluten-free fiber that is also very filling ans satisfying. This salad can be eaten alone or paired with a great meal, vegan or otherwise. I do hope you enjoy this hearty sensual salad as much as I do. Pre-heat the oven to 475° F. Line a heavy-duty rimmed baking sheet with parchment or a silpat mat. In a medium bowl, toss the butternut squash with the olive oil to coat. Season with the salt and pepper. Put the butternut squash onto the baking sheet and make sure there are evenly spread out. Roast until the squash is browned on bottom, 15-20 minutes. Flip squash and bake 5 more minutes till fork tender. Set aside to cool. Meanwhile mix in a large bowl the brown rice, arugula and pine nuts. In small bowl whisk together the dressing with shallots, sesame seed oil, tamari or soy sauce, agave, lemon juice, cumin, salt and pepper. Toss the dressing into the rice squash mixture till thoroughly combined. Add any additional salt and pepper to your liking. Serve and enjoy.